Wolves have made an official complaint to Walsall and the Football Association after two players reported they were racially abused at Banks's Stadium. 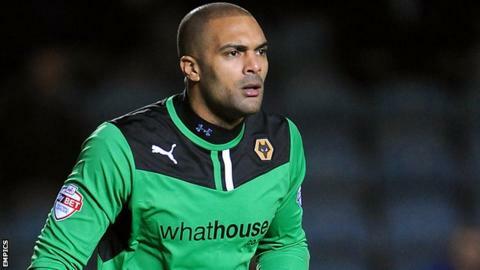 Goalkeeper Carl Ikeme and defender George Elokobi raised the issue to Wolves management staff after Saturday's 3-0 League One win. The abuse allegedly came from behind Ikeme's goal during the second half and in the first half as Elokobi warmed up. "I'm backing my players. Both George and Carl received racist abuse. It will, undoubtedly, be from individuals. "We back our players at Wolves. "There's no place for racism in the game and as we've said in our statement, we've made an official complaint, both to Walsall and to the Football Association. "I'm sure we'll all be working towards stamping that out and making sure that it doesn't happen again. That's the most important thing." Wolves said the complaint related to a "small number of individuals". A club statement added: "Wolves will always strongly support its players who are the victims of discrimination, and Carl Ikeme and George Elokobi both displayed admirable restraint in the face of receiving the abuse on Saturday." Walsall said they would fully co-operate in an investigation and issue a ban to anyone found guilty. "We are taking this matter very seriously and will fully co-operate with West Midlands Police and Wolverhampton Wanderers throughout this investigation," the Saddlers said in a statement on their website. "Both Wolves and Walsall are fiercely committed to stamping out all types of discrimination within football and will vigorously investigate any and all allegations of racist abuse. "Should anyone be found guilty of the above allegations, they will be issued with a lifetime ban from Banks's Stadium."